VertaseFLI was employed to carry out further assessment, and subsequent demolition and remediation works on the site of an old chapel most recently used for oil blending activities. Contamination consisted of heavily impacted soils and building materials with oils including impact to an adjacent stream. 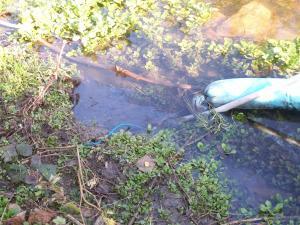 The site was particularly sensitive from an ecological prospective being adjacent to a stream feeding a SSSI. The stream was also home to crayfish and water voles. Extensive consultation was also required with English Nature as the site was an active bat roost and had nesting birds. The old chapel was to be demolished in a manner not to damage an adjacent house and to protect locally important memorial stone features. Once all necessary approvals were in place which included a land drainage consent for works to temporarily divert the stream, works commenced in a methodical and controlled manner; speed of works were sacrificed due to the environmental sensitivity of the site. 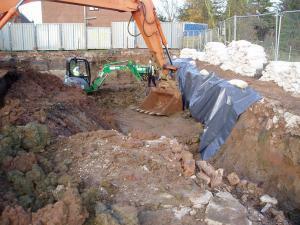 Works included additional site investigations to delineate extent of hydrocarbon contamination, excavation and disposal of hazardous waste soils (time and space prevented on site remediation), pump and treat of contaminated groundwater including free phase product, careful demolition of the old chapel and retention of special features, and remediation including re-alignment of the stream which had also been impacted by hydrocarbon contamination. Works were completed to the full satisfaction of all stakeholders and had no detrimental impact to the very sensitive local environment. VertaseFLI also seeded the site with a special seed blend to replicate the protected grasslands and the site was reinstated in readiness for future development.